The San Diego Regional Alliance for Fair Housing (SDRAFFH), the San Diego Housing Federation, California Housing Finance Agency, Federal Reserve Bank of San Francisco, and LISC San Diego. Manuel Pastor, Professor, Sociology and American Studies & Ethnicity I Director, USC Program for Environmental and Regional Equity (PERE) will deliver this year’s keynote address and challenge participants to look at fair housing and the cross-over issues as opportunities to innovate and improve our communities from within. 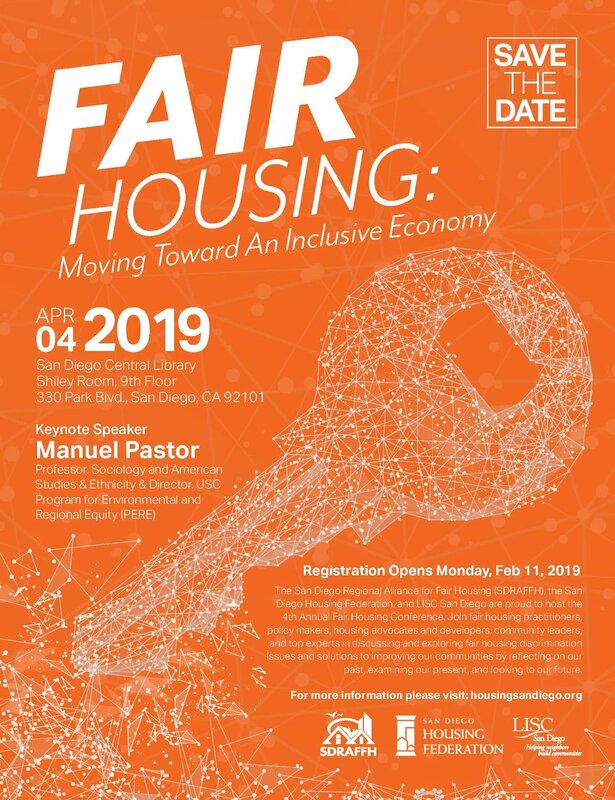 Join fair housing practitioners, policy makers, housing advocates and developers, community leaders, and top experts in discussing and exploring fair housing discrimination issues and solutions to improving our communities. Refunds can be made up to close of online-registration, Friday, March 22, 2019. After this date, no refunds will be made, however, you can change the name on a ticket. To view information from 2018, click here.